What a wonderful show. I was completely entranced, blown away really. 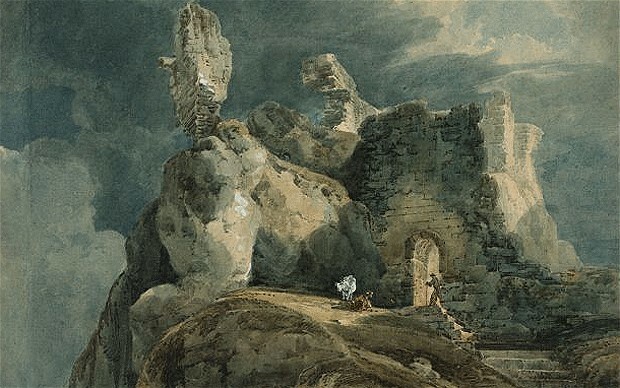 The range of work was wonderful, the history of the watercolour medium in England was masterfully presented too. A fantastically curated exhiition! Completely worth the price of a ticket to England. I expected many items such as the early maps and the small scientific illustration pieces. And, of course, I expected the delicate work of the landscape painters so I was ready for the works by Turner, Cozens, and Cotman. Expecting them didn’t make them any less wonderful though. But there were several pieces that just stopped me in my tracks. 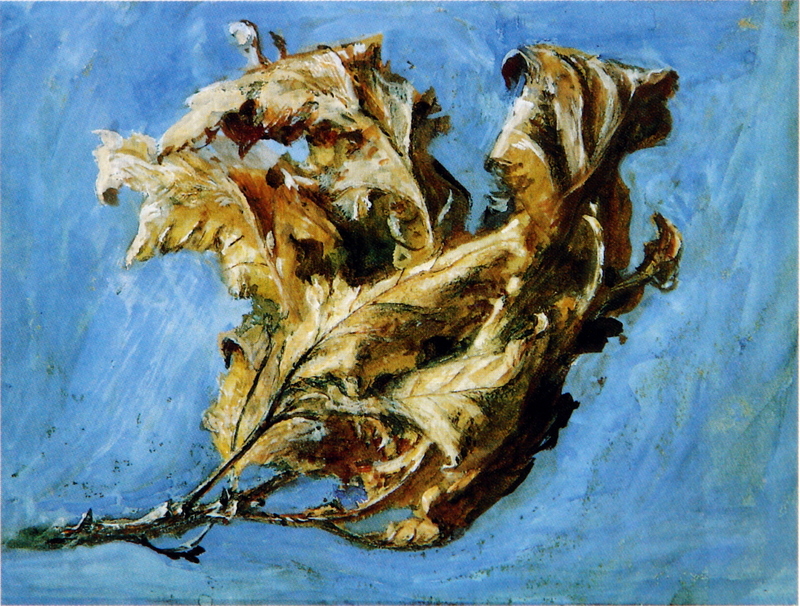 The first was a small study of an oak leaf by John Ruskin. I must have spent 20 minutes in front of that small work. I even got into a discussion about it with a fellow painter. It turned out he was also an art professor; a nice chap from Vancouver. Ruskin’s piece didn’t have all that atmospheric quality that I so love and admire when I think about English watercolour from the 18th and 19th century. But it was SO honest. The marks created a surface that not only looked rough but, on closer inspection were rough. Not any accidentally rough and jarring marks mar the image, these are so completely intentional. It is almost as if Franz Kline or Lucien Freud had taken up painting studies of leaves. In fact its directness made it seem, at least to my eye, almost American in its approach and spirit. Yes, I know Constable had that intensity of mark making at times as well … but never, to my eye at least, to this extent and on such a small scale format. The next piece that astounded me was one I had never seen before, not even in reproduction. 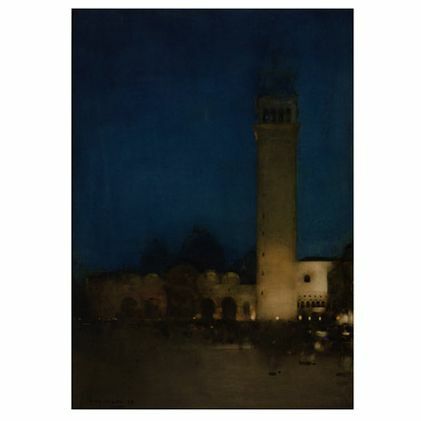 It is titled Blue Night, Venice. Painted by Herman Melville who I must admit is an artist with which I am less than familiar. But this piece is astounding. While it is not very large, the deep night sky color in the upper two thirds of the painting is completely seamless … and completely integrated into the landscape below. It almost seems to be poured into the composition. While it is naturalistic at every turn, it is as magically hypnotic and enigmatic as any surrealistic work by Magritte. The simple elegant quality of that large area of wash would make most any water media artist go green with envy. It would astound, and might scare away, many watercolor students too. Melville’s work was one of those pieces that stops the public, the amateur, and the professional alike. Probably the biggest take away I had though was my renewed excitement about the painter named Girtin. I had almost forgotten about his work. His delicate use of tone, his complexity of design so mark him as a painter of his age. But the exquisiteness of his work is enough to make me wish I had painted those scenes. Since leaving the exhibit I have been spending time re-exploring his work. As I have done so, I have noticed that his coloration and tonal ranges remind me of the still life painting af the American 20th century painter Charles Demuth. They shared an ability to capture both subtle texture and detail with such seemingly simple means and precise, deft brushwork. I am so glad I got to this exhibit. I am even more glad I went alone. I wallowed decadently in the joy of spending the afternoon lost in this show. At this point I will stop. Frankly I need to spend some time digesting the newer works a bit more before I talk about them. But they were just as astounding as the ones I’ve mentioned so far. More later on those beautiful pieces! This entry was posted on August 18, 2011 at 11:59 pm and is filed under Uncategorized. You can follow any responses to this entry through the RSS 2.0 feed. You can leave a response, or trackback from your own site. Thanks, John—–I LOVE that leaf!